10 years ago, iconic author Stephen King published a new novel entitled Cell, which was quickly eyed for a movie adaptation months before it was published. After a decade of development, which saw a number of filmmakers come and go, Lionsgate and Saban Films are getting ready to release Cell in theaters nationwide on July 8, preceded by an Ultra VOD release starting June 10. Today we have our first look at this thriller, which shows how technology is turned against us in frightening ways. Stephen King's best-selling novel is brought to terrifying life in this mind-blowing thriller starring John Cusack and Samuel L. Jackson. At the Boston airport, Clay (Cusack) witnesses a scene of chaotic mayhem when an electronic signal turns hundreds of cell phone users into rabid killers. Desperate to find his estranged wife and son, Clay teams with a train driver (Jackson) to battle the horde of murderous "phoners" as the city descends into apocalyptic madness. The first trailer, which debuted on Entertainment Tonight, reveals the lengths these strangers must go to, in order to survive this terrifying new world. The supporting cast includes Isabelle Fuhrman, Stacy Keach and Owen Teague, with Tod Williams directing from an adapted script by Adam Alleca and author Stephen King. Tod Williams' previous directorial credits include the hit sequel Paranormal Activity 2, along with The Door in the Floor and The Adventures of Sebastian Cole. Adam Alleca previously wrote the remake The Last House on the Left, and he also wrote upcoming movies such as Delirium and Standoff, the latter of which marks his directorial debut. Cell will be going up against 20th Century Fox's comedy Mike and Dave Need Wedding Dates and Universal's The Secret Life of Pets when it hits theaters on July 8. When Cell was first put into development in 2006, Eli Roth was attached to direct, but the project never got off the ground. We reported in 2009 that the novel was set to be turned into a four-hour TV mini-series, but that didn't happen either. It wasn't until John Cusack signed on in 2012 that this thriller finally started to take shape. In addition to the trailer, we also have the first poster from Cell, which you can check out below the trailer. 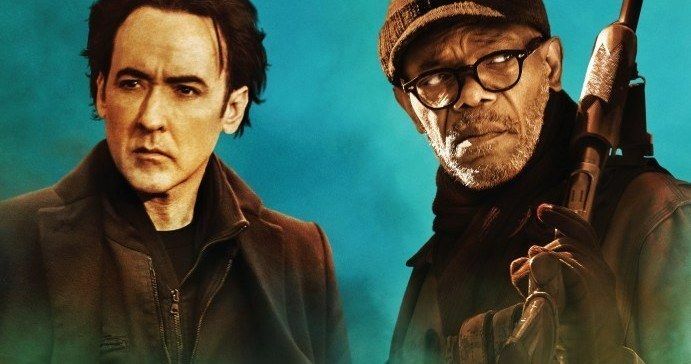 The poster features both John Cusack and Samuel L. Jackson, who are reuniting for the first time since they both starred in the 2007 thriller 1408, which was also based on a Stephen King novel. While we wait for more details on Cell, take a look at the trailer and poster below. EXCLUSIVE: Eli Roth Talks Cell, Trailer Trash, Thanksgiving and More!